There were a lot of things that Floofingtons knew. There were also a lot of things that he did not know. One thing that he did not know was that there were a lot of things that he did not know, as Floofingtons was thoroughly self-convinced that he knew everything. Floofingtons was very intelligent, sure. He'd read the Neopedia more than once, and most other books, too. 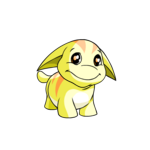 He understood the great complexity of everything that was science and Neopian and silently gloated about the great simplicity of every mind that wasn't his. He'd admired great researchers such as Professor Hugo and Lilian Fairweather when he was young, but now he was persuaded that his intelligence surpassed even that of the brilliant Dr. Sloth. It wasn't as if he was openly conceited about it; he mostly kept to himself because, to him, it didn't matter what the simple-minded anyone-who-wasn't-him thought. To Floofingtons, all that mattered was his own knowledge - his friends and relatives wouldn't understand anything of his brilliance. This is why he felt irritated to be interrupted by one of these very acquaintances while he sat in what should be the peaceful library, reading a copy of Sakhmet Natives to improve his already-excellent-amount-of historical knowledge. "Floofy!" Bluey called as he bounced happily into the room. 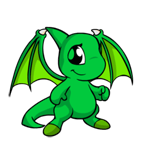 Bluey was a small and happy neopet. He was kind to everyone, and they sometimes weren't so kind to him, but he didn't care. Being alive and able to help others was all Bluey wanted from the world, but sometimes he would try a little too hard and end up doing to opposite of help and mess things up, and sometimes his curiosity got the better of him and he did things he wasn't supposed to, but his good nature and adorable charm was usually enough to keep others from getting too mad or irritated at him, unless said others included those like Floofingtons, who was constantly annoyed with Bluey. Grimacing at the childish nickname which Bluey had assigned to him once when he could not remember Floofingtons' real name, the intelligent white Poogle looked up from his book and at the petite blue Kacheek, asking with a sigh, "What is it, Bluey?" "I think that..." He thought about his wording which he then realized was flawed in his palpable eagerness. Revising his phrasing, Bluey finally answered, "I think I found a thing!" "A thing?" Floofingtons made no attempt to hide his disgust at Bluey's poor choice of words. "Yeah! A thing. Like... like a not-already-found thing." Bluey thought about this for a moment. "'Cept now it is found 'cause I... you know... found it." Floofingtons stared at him with a bored expression. Obviously failing to acknowledge Floofingtons' lack of interest, Bluey continued, "Look! I'll show you!" He ran past the dozens of bookshelves and out of the sky-blue room. Floofingtons sighed in relief, only to frown again upon seeing Bluey return moments later, with a brown paper bag in his hand. It was quite the large paper bag, but Floofingtons could not tell what was inside by simply looking at it. It must've been something delicate, though, judging by the way Bluey was holding it only from the top and being careful not to touch where the item must have been at the bottom, which, Floofingtons noted, was quite out of character for the blue Kacheek – Bluey was never careful with anything. Floofingtons mutely and with since-settled frustration recalled the time he was building a robot that would automatically make them fresh slushies and asked Bluey to pass him a screwdriver, and while doing as told the blue Kacheek accidently tripped over his own two feet and landed on the machine, crushing it. Still not remotely interested in whatever Bluey was so excited to show him, Floofingtons put his book in his lap, but did not shut it, not wanting to loose his page, attempting to humor the blue Kacheek. Bluey, his excitement almost tangible, reached with hesitation, to give it the effect of faux importance, into the bag. Floofingtons watched impatiently as Bluey pulled out the item he was so eager to reveal. He pulled out a lemon jelly, which wobbled as if it, too, were excited about the unfolding events. Bluey looked at the white Poogle expectantly. "What about it?" Floofingtons asked. What could Bluey possibly have discovered involving jelly? Something about its viscosity? The average density of lemon jelly compared to that of poisonous jelly? The ratio of its wiggliness to its wobbliness? These were all things Floofingtons already knew, so, in his mind, he continued to dismiss the blue Kacheek's display as something irrelevant to anything labeled 'undiscovered'. "I was thinking about stuff, a-and I realized – jelly! It's gotta come from somewhere, right?" Bluey was almost shaking with enthusiasm. Bluey did not wait for an answer, but Floofingtons hadn't been planning on giving him one. "So I... I came to the..." Bluey thought for a moment, "-What's that word? It means, like, 'ending'..."
Floofingtons sighed and filled in the word he knew Bluey was trying to suggest, "Conclusion?" "Right." Bluey nodded, and then continued, the whole time none of his enthusiasm fading, "I came to the conclusion that there must be a Jelly World!" The blue Kacheek waited eagerly for Floofingtons' response, holding the jelly out in front of him as it wobbled patiently. Floofingtons watched the jelly wobble as he thought about this. And he thought about it. And he thought about it. And he watched the jelly wobble. And the thought about it. Finally, he replied, "That's ridiculous." Bluey looked disappointed. He tried to think about something to say to Floofingtons in order to try and convince him of his truly brilliant discovery, but he'd already exhausted his ability to think through making it. Not to mention, the blue Kacheek knew that there was no use arguing with the gifted and intelligent Floofingtons. Bluey opened his mouth a few times, as if about to say something, but, unable to think of another way to back up his theory, he quietly slipped the jelly which had since stopped wobbling because of Bluey's sudden stillness, but now was again jiggling from side to side, back into the brown paper bag which no longer seemed to hold a discovery, or anything but a cheap dessert, and left the room in defeat. The expression on his face as he did so, however, was one not of disappointment, but one of determination. Once Bluey was gone, Floofingtons returned to his book. He could not concentrate, however, as his mind kept wandering to what Bluey had said. 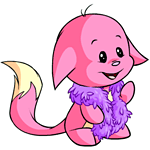 The blue Kacheek's logic was surprisingly flawless, and Floofingtons was perturbed by idea that there was something in Neopia about which he did not know, and he thought he did not like it. Floofingtons shut the book he had only completed one chapter of before Bluey's interruption, Sakhmet Natives, and sighed. 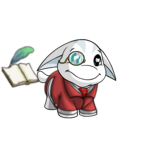 He stood up and moved back to where the Neopian Desert books were kept and replaced his to its rightful place between Sakhmet Petpets and Sakhmet Tales. After ensuring all of the books in the section were straight and orderly, the great and brilliant Floofingtons moved slowly and determinedly to the J section of the library; intent on finding a book which explores this mythical "Jelly Word", and noted with surprising glee and unwavering resolve that there were always new things to be discovered in great land of Neopia, and there was indeed things which Floofingtons did not know. No green Shoyrus were harmed in the making of this comic.